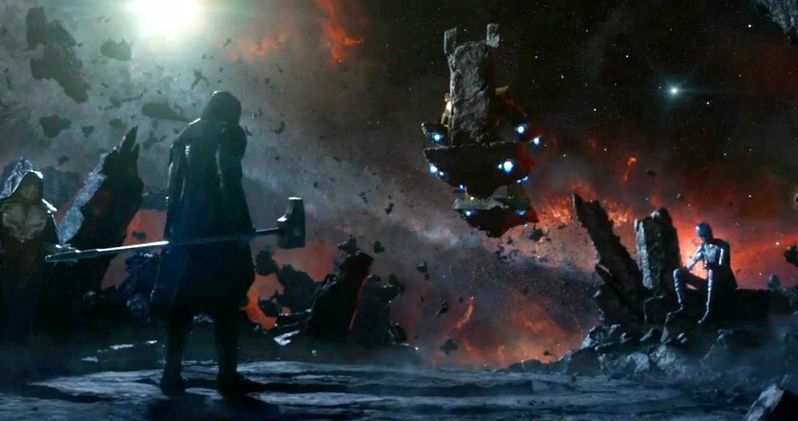 Josh Brolin's Thanos won't be revealed until Guardians of the Galaxy is actually playing in theaters, but a new featurette has our first glimpse at Marvel's big bad villain sitting in his throne while he looks down on Nebula and Ronan. It's a 'blink and you'll miss it' moment found in a behind-the-scenes look at the relationship between mean green Gamora (Zoe Saldana) and her blue skinned rival Nebula (Karen Gillan). Watch the actors and filmmakers discuss this unique pairing, which is sure to end in an epic fight, then check out the whole movie in just two weekends!